Happy Wednesday, everyone! This week has flown by. I landed in NYC last night and it’s freezing. Today I get the keys to my new apartment (eek!!) so I’ll be sharing that on Snapchat with you – @laurenpatao. Today I wanted to share with you my favorite blush sweater that I’ve already worn several times on Instagram. When I love something, I love it. 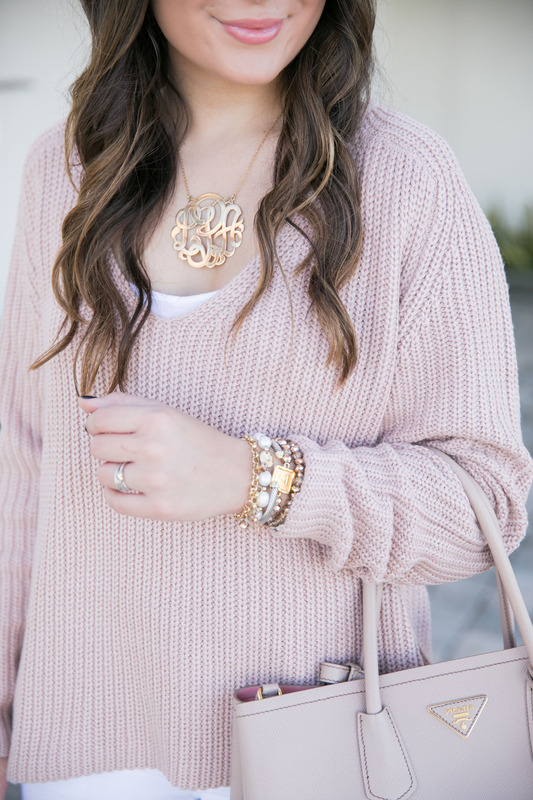 This blush sweater is one of those pieces that I could never take off! It’s so soft and cozy and I wear it with a tank under sometimes to add an element of layering. Plus, now living in NYC, I’m sure I’ll need more than a tank under… haha! I also have it in the white color and sized up to a medium for a looser fit. These boots are old from Sole Society but these are super similar and in stock! Anyways, I hope you all have an amazing day! Make sure to follow along on snap and pick up this gorgeous blush sweater (maybe in both colors, too…)! Love the blush sweater with winter white jeans. Blush looks so good on you! So exciting that you will be moving to NYC! Love the blush sweater and bag! Congrats on moving to NYC! I love this color combo on you! So pretty! Blush is such a gorgeous color on you! love your sweater! Blush is seriously the perfect color for you!! This is really really cute! Omg! Blush is your color! You look fab in this fun, cozy sweater. Perfect for these colder temps! What a pretty blush sweater!! You look gorgeous! OOO I love blush it is so pretty! I also loved the details bar that popped up on the side of your site!! Can never have too many blush sweaters! I love this one! You are the queen of finding the best blush pieces. You look amazing girl!